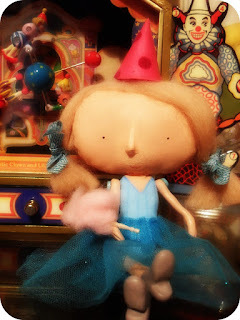 Some have already noticed a change in my doll making. Do you like it? I love ALL of your dolls. They are adorable. Can't wait to see the story! I like :):) . Everyone goes through a phase :). 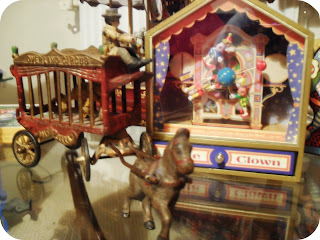 Love all your circus paraphernalia. It must have taken you ages to make that video, Patricia.Just to show the carriage riding..more than 1 hour? I love the storyline. You should seriously consider submitting your videos for competition, Patricia. They are really great productions :). You can even add in appropriate videos that all props are made by Papillon Bleu UK :). Or The Children's Emporium :). je lis pas, grosse paresseuse que je suis, mais rien que les images, keskecébo! i want a doll like this!!!!!!!!!!!! !so cute!can i order one ???? I love your dolls but I do notice the change and I really love it! I love all of your videos!!! oh! how I dream of making one, it must have taken a long time to shoot that. You did an incredible job on it. The toys are beautiful and is that cotton candy in her hand? Love it! I absolutely LOVED the little stop motion movie you made for her (all these little carousel toys...oh my they are so sweet and elegant and beautiful!!)!!!!!!!!!!! Your dolls are small yet loaded with personality and charm... just AMAZING! 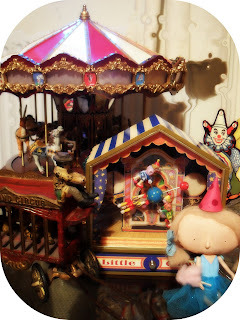 Another beautiful video - thanks so much for showing us these lovely toys - especially the horsedrawn circus cart. And yes your new style dolls are gorgeous - just love her beautiful dress! OMG I love your little circus doll ! She is so adorable!!! How do you make your dolls? I would love to try making one ! P.S. I am so glad you decided to join our Practical Magic Blog Party !!!! Oui, j'ai vu ta nouvelle façon de faire la poupée, j'aime bien. madame tata l'anglaise, t'es trop forte! faudrait que tu me donnes keke cours tiens, ça serait pas du luxe... merci pour nos yeux! Congrats! I have chosen your blog as honorable mention, as one of my favorite blogs of substance !! Check out my post here, and don't forget to grab your Award Button at the top! Ooooh! Patricia those toys are enchanting...but your precious little doll is quite spectacular! Liberty and I still marvel at beautiful little Ruby. Adorable! Yes, I love the new direction, and I totally adore your little movies. oh.... quel merveilleux court métrage!!! ton talent me fascine, j'adore!! !